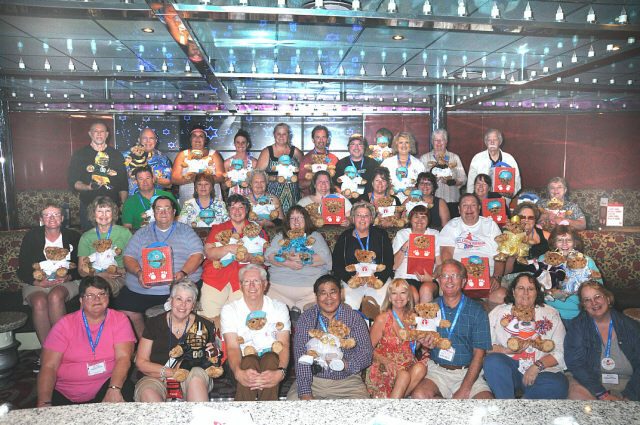 In an incredible display of generosity, participants from the John Heald Bloggers Cruise, currently taking place on the Carnival Glory, have donated more than $1,500 during an on-board fundraising activity benefiting St. Jude Children’s Hospital, one of the line’s favorite charities. 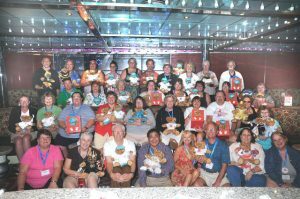 Bloggers Cruise attendees participated in Carnival’s popular Teddy Bear Workshop, purchasing 51 of the cuddly St. Jude bears which the bloggers offered to donate to patients at St. Jude Children’s Research Hospital (usually the bears are taken home as cruise souvenirs by those who built them). The special keepsake bears feature doctor’s apparel, including scrubs, surgical mask, and a lab coat. Proceeds benefit St. Jude Children’s Research Hospital. The bloggers’ bear donation was spearheaded by Big Ed Konefe and his Evil Krewe who are longtime readers of Heald’s blog. The Teddy Bear Workshop is part of Carnival’s “Care to Play: Carnival For St. Jude Kids” program whose goal is to raise $3 million over a three-year period for the hospital, one of the world’s premier centers for the research and treatment of pediatric cancer and other catastrophic diseases. John Heald’s Bloggers Cruise is an annual event that brings together fans of the senior cruise director’s blog (www.johnhealdsblog.com), which has generated more than 9 million views since debuting in 2007.